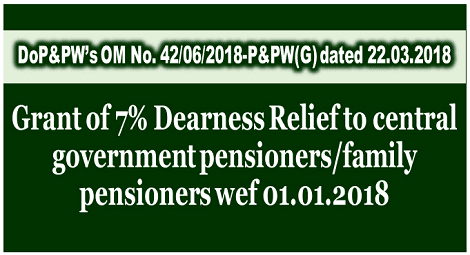 Department of Pension & Pensioners' Welfare issued OM No.42/06/2018-P&PW(G) dated 22nd March 2018 regarding grant of Dearness Relief admissible to Central Government pensioners/family pensioners. The Dearness Relief shall be enhanced from the existing rate of 5% to 7% wef 01.01.2018. The payment of arrears of Dearness Relief shall not be made before the date of disbursement of pension/family pension of March, 2018.